The Joyce experience is especially rewarding in a reading group environment. Everybody’s knowledge, no matter how specialized or obscure, is invariably brought to bear during discussion. Active and inquisitive participation from “beginners” has always been an essential part of the group’s success. Over the years, JoyceGroup Santa Fe has made it’s way through all of Joyce’s major works at least twice, except Finnegans Wake of course, which after 19 years, we’ve just started in on chapter 13 (technically part III, episode 1 – pp. 403-428). Right now, we spend the first portion on Ulysses and the second on Finnegan. You can read more about our history here, and you can get an idea of the pace we work at by viewing our chronology. Every manner of reader – from newcomer to veteran, from latecomer to early-leaver, from the timid to the talkative – is welcome and encouraged to join us as often or sporadically as he or she likes. Everyone – no matter how green – is brought up to speed, and for the truly unprepared, extra copies of whatever books we’re reading are available. So enough excuses – please join us. JoyceGroup Santa Fe meets pretty much every Saturday – holidays included. If you’re at all interested in coming, you can check here to confirm that it it is indeed happening – we always keep this page updated. Winiarski Seminar Building – room #201. First, find the St. John’s campus – quite easy with GoogleMaps, and there are road signs all over town to point you there. From the visitor lot, a little trail passing through a nearby gazebo will take you down to the sidewalk on the other side of the main road. Follow that until you reach the first driveway on the right, and walk up said driveway through the staff parking lot. 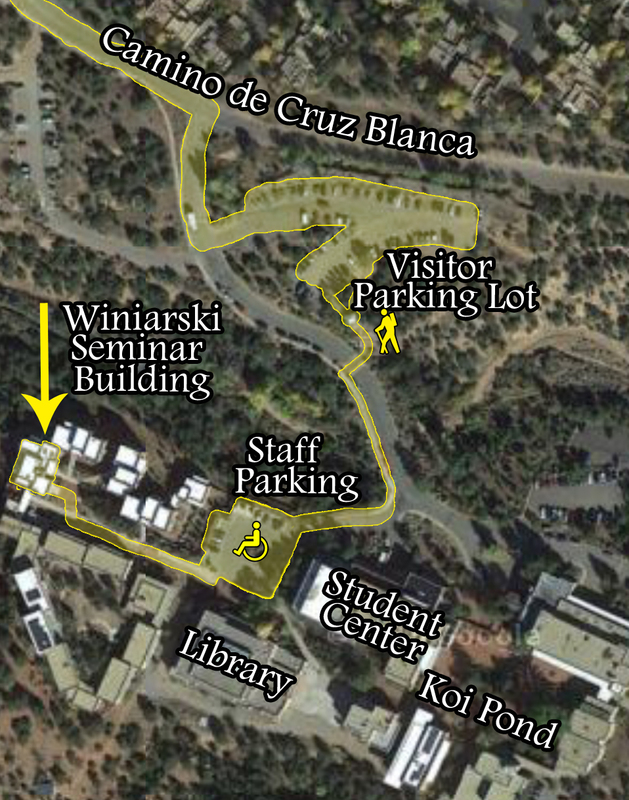 On the other side of the staff lot is a nice sidewalk which, if you follow it to the right, will take you straight to the front door of the Winiarski Seminar Building. Room 201 is to the right as you enter. If you’re interested in coming, please do let us know by dropping us a line using the fields below. We’ve never had to turn anyone away for want of room, but a bit of foreknowledge never hurts – especially if we need to get extra chairs. The table does sometimes fill up.